The “Old Abbey of Kortenberg” is the property of the Archbishopric of Mechelen-Brussels. The Archbishopric has entrusted the members of the Council of administration with the mission of making the Abbey a centre of spirituality. So we make it our duty to receive you in a welcoming place, in a magnificent park in order for you to experience a time of refreshment and spirituality. The co-ordinator Veerle Magnus is helped by some voluntary workers and by some staff who take responsibility for the administration and the upkeep of the parks and buildings. From April 2nd 2017 to end September, we will be serving you on our terrace. and on Sundays and Holidays from 11:30 to 20:00. You will find on the Dutch version of our website all the needed explanations about the rooms: their sizes, their area, their furnishing, the number of people they can welcome according to the presentation of the furniture of the room and the equipment as well as some photos. It is possible to stay at the Abbey in convent bedrooms adapted for 1 or 2 persons. They contain: one or two bed(s), a basin with hot and cold water, a cupboard, a table and a chair. The showers and toilets are found at the end of the corridor. We have 24 bedrooms with 1 bed and 12 bedrooms with 2 beds, which are distributed over two floors. A lift services these floors. The peacefulness and the view on the park of the Abbey make it a remarkable place of tranquillity and silence. The catering in the Abbey is provided by a motivated team which offers quality meals in a beautiful environment. or in the little book edited to this effect and which you can buy for 1 EUR at the Abbey itself. You may contact us by telephone ion the week days from 9 a.m. to 5 p.m. It is possible to visit the building but only by appointment. From Brussels, take the last street right just before the first traffic lights in Kortenberg and follow De Walsplein then --> 3. 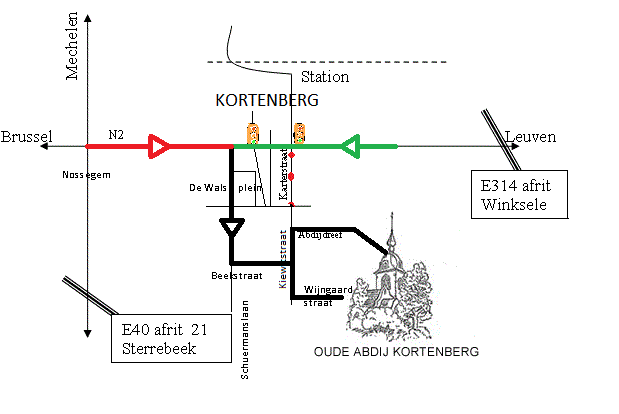 From Leuven, take the first street left after the second traffic lights in Kortenberg and follow De Walsplein. Then 100 m further: take the fork on the right: you are there! In order to avoid cars nuisance in the park, after unloading, please leave your car in the close parking place in "CC Colomba". Follow the street signs "CC Colomba" or Sporthal" (Wijngaardstraat, 1, for GPS users). You will have direct access to the park via a charming 6 minute walk. It is possible to arrive by train and bus to Kortenberg. See the timetables on the appropriate web-sites (SNCB and De Lijn). The train arrives at the station of Kortenberg which is located at 1 km from the Abbey. Go to “centrum” through the Stationstraat, then take Karterstraat in front of you up to Kiewitstraat and follow the map hereabove. The bus arrives on the Leuvensesteenweg, the stop is at the crossroads of Stationstraat and Karterstraat. Take Karterstraat up to Kiewitstraat then follow the map.